Malaysian Watercolours: Can you learn watercolours via CD? Can you learn watercolour via CDs? Well I think you can. Not in the old days when lessons take ages to arrive and the pictures come static, ie from photos and drawings. Today you can. With the advancement of technology spurred by Internet growth, softwares allow tutors to record "live instructions" in CDs or live-streaming via various computer-friendly softwares. You may be a thousand mile away and it makes no difference as you can learn almost anything - as if you are right there beside the teacher as the art class unflod before your eyes, in full motion picture format. And on the Internet, you get plenty of CDs offering to teach you about painting, but where watercolours are concerned, I can recommend one which is really unique and offers great value for money. 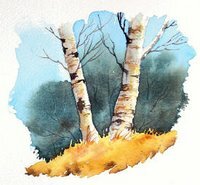 If you are a beginner to watercolour (or someone who wants to go back to it), check out Peter Saw's Interactive Watercolour website. Veteran watercolourist Peter Saw's Interactive Watercolour CD offers various levels of learning experience - from beginners to medium-advanced learners who seek to master this fluid medium. The trees in the picture are among the lessons - doodles and actually painting - in Peter's Interactive Watercolour. I have seen this CD, used it and recommend it to anyone seeking to learn the finer strokes of British watercolour. For beginners, especially, I think it is a good value for money. Peter takes you through a whole series of painting several objects in various styles. What is interesting is that Peter uses movie files to get his lessons across. And in watercolour, this is priceless. Being shown how a painting is done, or errors corrected, helps a lot in the learning process and progressing from that. One thing that makes Peter's CD offering unique is the lively forum which he has set up for his "students" - you learn from the CD and you meet other users . You get to ask questions - including directing them to the master himself. And he answers them!